Welcome to this section! Here you can find many interesting Facts about Turrican. If you think you know anything that should be mentioned here, please contact me. TURRICAN 3 Development Diary - complete with many pictures ! Turrican 4 by Neon ? A short quote from an interview with M.Trenz - and the answer to the question "why was Turrican 3d stopped ?" Interview with Factor 5 - "Wo bleibt Turrican 3?" The Turrican 1 C64 Turrican Soundtrack, Subsong 2 was stolen from "Transformers the Movie" (1985)! Best compare it to the track "Escape". 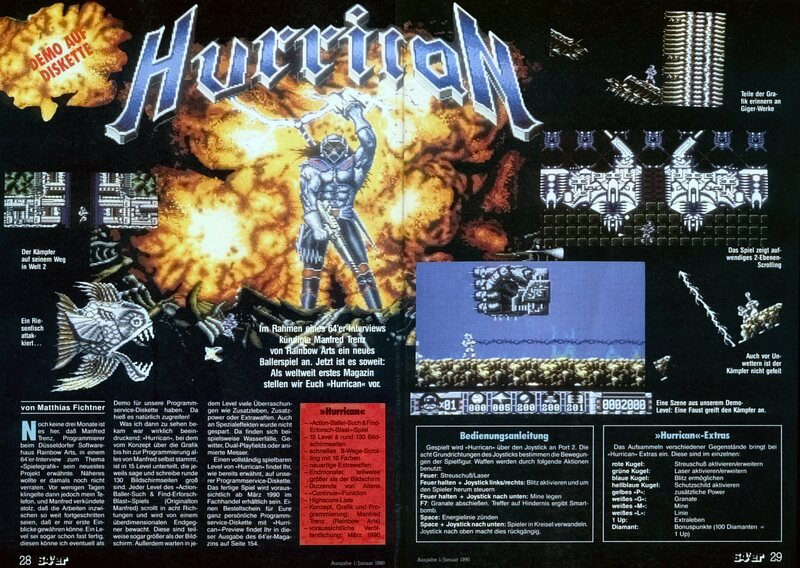 The Name Turrican has its origin in the telephone-book of Düsseldorf, from an italian named "Turricano"
Turrican´s worktitle was Hurrican, it was renamed to Turrican short before the release to avoid naming conflicts with another game. See an Article with the original title here. As the Turrican 2 Demo was prelaunched on a computer-show in Cologne, so many people tried to get one of the 900 copies that 2 people were injured ! Turrican 3 was first released for Megadrive as Mega Turrican . At first, Factor 5 started Turrican 3 on the Amiga, they even had a demo with the plasma-rope. But then began the problems with the Amiga and they switched to the Sega MegaDrive. One year later Kaiko offered Rainbow Arts to do a Turrican 3 on Amiga, not identical to MegaTurrican. 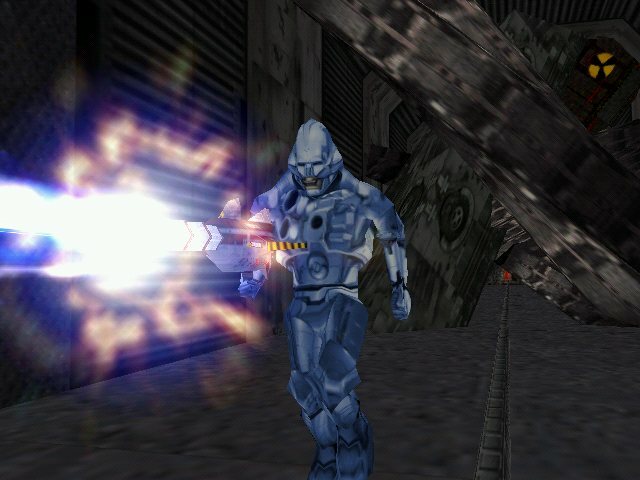 But there were copyright problems, and so MegaTurrican was ported. The inspiration for Turrican were Metroid (NES, Nintendo), Psycho-Nics Oscar (Arcade, 1987 Data East Corporation ) and Mario (Nintendo). 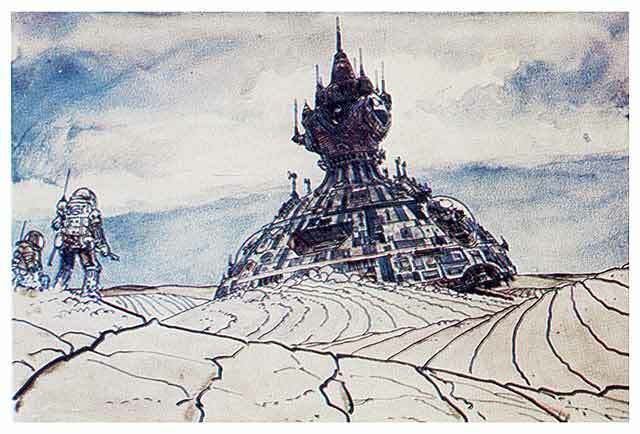 It once was once planned to beam Turrican star-trek like into the stages, but they were never happy with the results. The remains were used in Turrican 2. This was the particle implosion-system mentioned in the Turrican 1 Demo. The Box to activate the elevator in Turrican 1 simply was part of the copy-protection. If you had a copy, it just was not there, as well as some other Bonus rooms. 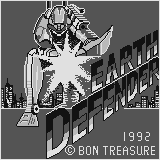 The german techno-Band Scooter remixed the Turrican 2 Extro-Song "Freedom", the track is named "Level One"
In "Earth Defender", only available on the SuperVision-Handheld they even stole the Turrican 1-Cover. The 2 facts above may be the reason why it is so complicated for both to release a new Turrican. Turrican was performed live, with a full orchestra and choir at Games-Convention opening-Concerts in Leipzig and at the Symphonic Shades-Concert in Koeln. 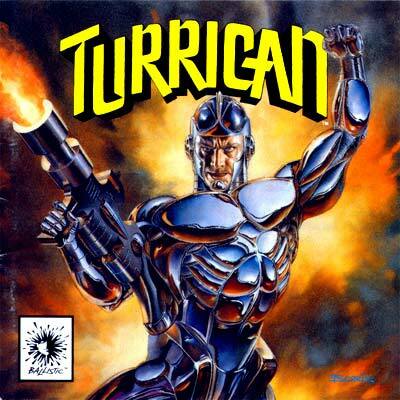 The Turrican 3 / Mega Turrican Boss was inspired by the Marvel-comic-character "Stryfe", he even is named as such in the ASM source code of the Turrican 3 intro. 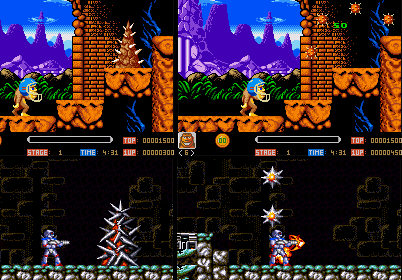 The size (of Turrican 2 levels anyway) differs per level, level one is approximatly 130x51 blocks (1 block = 32x32 pixels) so this would be (130x32)/320 = 13 screens wide and (32*51)/200= 8+ screens heigh. For every 32x32 Block there are 16 Bytes in a table, which divide the block in 16 8x8 Blocks.